Good Afternoon, Tuesday Friends! My husband and I tried a new recipe last night for dinner. It was so delicious I had to share it! It’s called Quinoa Black Bean Salad. I promise, if you are a fan of black beans, you’ll LOVE it! While the quinoa is cooking, mix together the ingredients for the dressing in a small bowl and set aside. Combine the black beans, corn, bell pepper, cilantro, onions and garlic in a separate bowl. 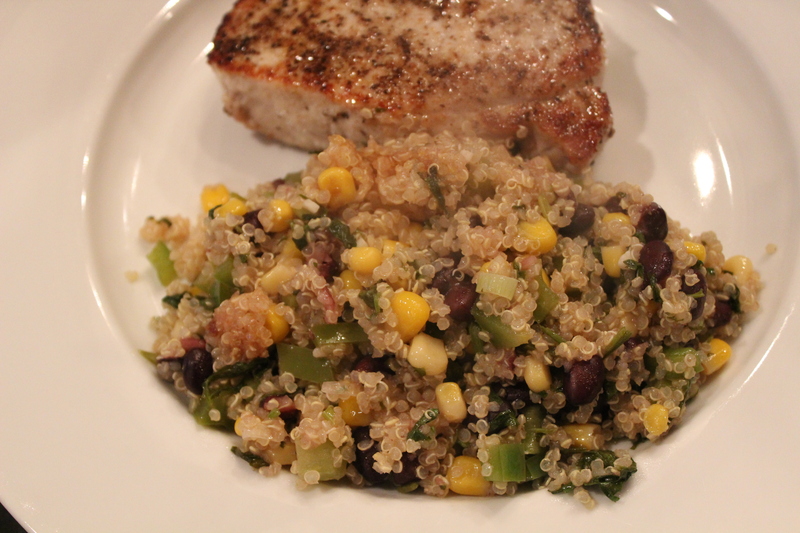 Once the quinoa is done transfer to a larger pan and add the dressing and the black bean mixture together. Continue cooking until heated thoroughly. This dish can be served hot or cold! Last night we had it warm along with a pork chop but today for lunch I added some fresh chopped cherry tomatoes and it was delicious cold too! This dish is so simple to make and the fresh cilantro and lime give it tons of amazing flavor. I have to admit my husband was a little skeptical when I first described the recipe, but then he came around when he saw the ingredients. This is definitely a keeper! And with temperatures soaring in the 90’s this week, this is the perfect summer time salad. Plus, isn’t it pretty?